when a customer stops doing business with a company, 68% of the time it’s because they feel ignored, underappreciated, or taken for granted? when an employee quits, 67% of the time it’s because of their manager? only 42% of employees say that they received any kind of recognition in the past year? Those surprising statistics show why we need today’s guest, Lisa Ryan, and her business, Grategy, LLC. Grategy is a portmanteau of gratitude and strategy. The company teaches other organizations how to keep their top talent engaged, enthusiastic, and committed to long-term employment by harnessing the power of appreciation in the workplace. You might be saying, “Hey, why should I thank my employees for doing their job?” Well, if you want your employees to give you their blood, their sweat, and their tears, that’s what you do: you acknowledge them. As an added bonus, it costs nothing! On top of all that, you’ll see tangible results in your team’s productivity, attitude, and overall profitability to the company if you take the time to look at your people as more than employee IDs. Appreciated employees are more profitable in the short-term and retaining them will save you money in the the long-term. The process of hiring a new, minimum wage employee can cost anywhere from $2,000 to $16,000. That’s a big ROI for a change in attitude! Another way to show appreciation is to invest in your employees, and to invest in all of them. Investing in everyone creates connections, conversations, and opportunities for people to learn and grow together. If you empower someone with an opportunity to grow, they just might surprise you. Employers need to be sincere, be consistent, and can’t put a compliance factor around it. Lisa is inspiring an incredibly necessary attitude change in business environments. As the Baby Boomers retire and a new generation fills in the workforce, you will want those employees to feel appreciated and respected – you want them to work for you. Remember: show appreciation and gratitude to your talent so you can keep them on the payroll. 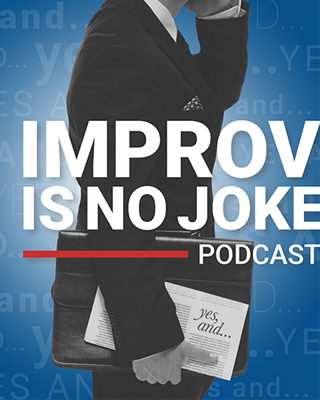 Peter: Welcome to Improv is no Joke podcast, where it’s all about becoming a more effective communicator by embracing the principles of improvisation. I’m your host Peter Margaritis, the self-proclaimed chief edutainment officer of my business, The Accidental Accountant. My goal is to provide you with thought-provoking interviews with business leaders so you can become an effective improviser, which will lead to building stronger relationships with clients, customers, colleagues and even your family, so let’s start the show. Peter: Welcome to episode 38 of Improv is no Joke podcast. Thank you very much for downloading this episode. 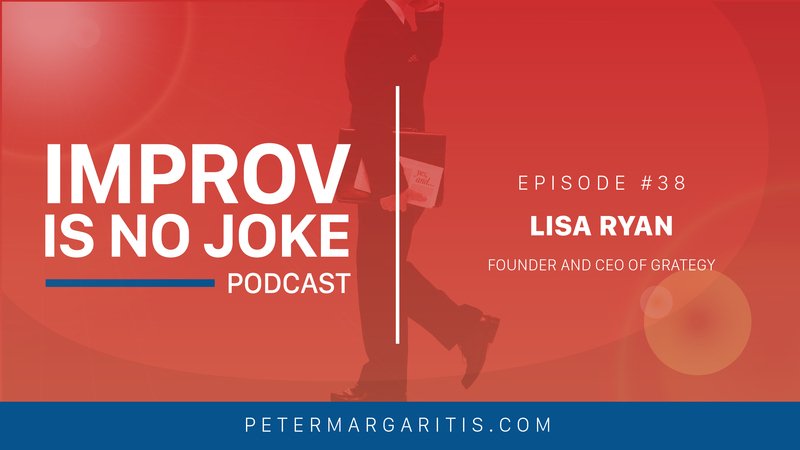 Today’s guest is Lisa Ryan, who’s the founder and CEO of Grategy. Grategy is a combination of gratitude and strategy to help companies keep their top talent from becoming someone else’s. Lisa and I talk about when she was restructured out of her full-time sales job and how that became the inspiration for started her own business. She was well-known and well-liked in the company and she was having the best year ever but then the company had to restructure and she lost her job. You would have thought, as a valuable employee, the company would have thanked her for seven years of service or shown some type of gratitude towards her. They didn’t show any gratitude… and born was Grategy. You keep your employees and your clients by the way you treat them. Show the appreciation. Period. The best part is that it doesn’t cost you anything. Zero zilch nada nothing. However, companies spend a lot of money on stuff. Points. If you get enough points you can pick from this catalog and maybe you get to go home with a big-screen television. Lisa states “you don’t need to spend that kind of money if you’re paying them a livable wage. They’re not going to leave you over money if you’re treating your people with respect and showing them gratitude.” As mother Teresa once said, “We are more star for appreciation then we are for bread.” Research shows that people with a gratitude practice are happier, they work out more often, and they complain less, and have fewer physical ailments, and they are emotionally available and nicer to be around – gratitude works. I’m sure you’ll enjoy our conversation and, as you listen to our interview, you’ll hear many references to the principles of improvisation, just like the two above. If you’re new to this podcast go back to episode 0 and listen to when I discuss, in depth, about the principles of improvisation. One of my goals with this podcast is that it will help you begin to make changes in your work and personal lives so you can connect better with others and create meaningful relationships. Many people have said it takes 21 days to start a habit but a lifetime to keep that pattern. That’s why I created the Yes, And challenge to help keep the principles of improvisation in front of you so you can build up your improvisational muscle. To sign up please go to PeterMargaritis.com and scroll down to the Yes, And challenge call to action and click the register to begin building the productive habit of Yes, And and the principles of improvisation. And remember to share your experiences on Twitter using the hashtag #yesandchallenge. Now if you’re unsure of what the SN challenge is all about, I discussed this in detail in episode 0 as well. 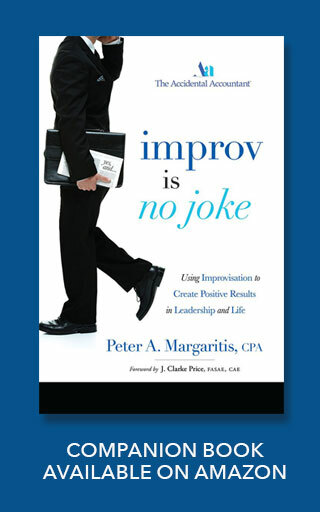 Remember you can subscribe to my podcast on itunes, stitcher, and google play, and you can purchase my book Improv is no Joke: Using Improvisation to Create Positive Results in Leadership and Life on Amazon. It’s available in paperback and on kindle. Now with that said let’s get to the interview with Lisa Ryan. Peter: Hey everybody, welcome back. I am with Lisa Ryan today and, before I introduce Lisa Ryan, I just want to read what’s on her LinkedIn page. I find it extremely fascinating. She’s an employee engagement speaker and a workshop facilitator to help you keep your top talent from becoming someone else’s. Now if that hasn’t got your attention I don’t know what will because we’re all looking for the best and the brightest, but if they keep leaving and going someplace else we need somebody like her to help us keep these people in our organization. So, first and foremost, thank you so very much Lisa for being a guest on my podcast today. Lisa: You are very welcome, my friend. It’s great to be here. Peter: It’s good to have you. Just to get everybody in my audience up to speed, tell us a little bit about who Lisa Ryan is. Lisa: Okay, well I spent most of my career in sales marketing and training. I have been wanting to speak for most of my life. It actually showed up on one of my goal list for the first time in 1987 when, of course, I was six years old (if you’re doing the math). Peter: I was thinking three but that’s okay. Lisa: See, there you go. And when my position was eliminated in October of 2010 via group conference call, with 12 of us getting the boot at the same time… that is not a great way to get fired, by the way. Lisa I just decided that I would not let any organization do that to me again and Grategy was born on that day. My friends would tell me hey Lisa that phone call was a blessing in disguise and my only response is, of course, oh honey there was no disguise. Lisa: [laughs] So when it comes to doing something that you absolutely love, sometimes it happens in ways unexpected. I always thought, hey, I’m going to build up my speaking business then I’m going to quit my job, but I had a very lucrative job and it wasn’t one that you just quit. You feel that you have those golden handcuffs on but, when this when the opportunity is given to you to have a choice… I could have wallowed or I could have done something that I loved and I’m very happy to say that, six years, later I’m still loving it. Peter: That’s great. We have a little bit of a similar background because, at one point in time many years ago, I was downsized, reengineered laid off, fired, something along those lines, from a company in Columbus, and I remember that first Monday waking up going “Well what do I do? This isn’t vacation. What do I do?” And that kind of held on for a little bit. A couple days later, somebody said this could be the best thing possible for you and I did a complete change in attitude. And, at the time, it was. It actually turned out to be the best thing possible for me. This is back in the late nineties. Peter: I probably wouldn’t be doing this if I hadn’t have been re-engineered back in the day. So you took that opportunity and turned it into a business. Yeah, because I knew that one of the things that I went through myself is that I’ve been with this company for seven years. I was on every product team that they had. I was well-known, well-liked in the company. I was having my best year ever and then, when they had to make a difficult choice and I’m sure that it was for them to do that kind of restructuring, but there was really nothing along the lines of “hey thanks for your service, we’re so sorry to see you go.” There was there was really nothing like that and I knew that it really just brought to light the gratitude, the appreciation that acknowledging your employees is something that you do, whether you’re in my situation like this and you have to let go a valuable employee or just to keep your employees there. You keep your employees and your best clients from becoming someone else’s by the way you treat them. Peter: Wow, such a novel concept that it’s so hard and a lot of organizations to accomplish and, on your LinkedIn page, you go “do you know that when a customer stops doing business with a company, 68 percent of the time it’s because they feel ignored, underappreciated, or taken for granted? Or when an employee quits, 67 percent of the time it’s because of their manager.” Okay, the last one. “Only 42 percent of employees say that they received any kind of recognition in the past year.” Man… one, those two numbers are very high and, two, that last one is very low, in my mind, because we are all in the people business no matter what product or service it is that we sell or do. Without people we can’t do business, so we should be appreciating our people a heck of a lot more than we currently are. Lisa: Well, absolutely, and I hear different responses. Some managers will say “but Lisa why should I thank my employees for doing their job?” Okay, well if you want your employees to give you their blood, their sweat, their tears, that’s what you do: you acknowledge them. It costs nothing. Now so many companies are focused on giving stuff. Get so many points and you can pick from this catalog and you can do this and this and this and I’m going to give you a big screen television, but sometimes, when it actually comes down to it, you don’t need to spend that kind of money. If somebody is making a livable wage and they feel appreciated, they’re not necessarily going to go down the street for more money. They may go down the street because they feel that that company is going to recognize them more, but like Mother Teresa said, “We are more starved for appreciation then we are for bread,” and I think that this is a message that corporate America really needs to get to because the talent pool is shrinking. And when we have those awesome employees that we bring into our company, we have to figure out how to keep them so that they don’t take those talents and go somewhere else. Peter: When you said the word appreciation, I remember one owner of a company making this comment. Something along the lines of “my employees they want appreciation. They want appreciation? I’ll show them appreciation. It’s called a paycheck. I keep signing it for them.” And go that’s kind of the wrong attitude… but then I also want to explore this concept of why we aren’t spending the time with people? Are we are using that 80/20 approach? We’re spending eighty percent of our time with the bottom 20 percent of those within the organization, thereby ignoring our other 80 percent? Lisa: Yeah, I think all of the above. Because we always pay attention to our rockstars, of course. We’re going to give them all kinds of kudos because of who they are and we spend a lot of time with our problem children because we have to fix them, because obviously they’re “broken” (I’m saying this in jest). Lisa: But a lot of times it’s that’s that steady Eddie that doesn’t get any attention. Eddie’s the employee and he shows up and he does his job and he’s never going to be a rockstar. He’s not a problem child. But because he’s there and he gets his paycheck, we don’t really pay any attention to Eddie. I tell my clients it’s like what if you went up to Eddie and just said “I just want to let you know that I can always count on you, your work is done well, and I’m just glad that you’re here,” you may be the first person in Eddie’s whole life to ever acknowledge him. And we go back to mother Teresa, who talks about how starved we are for that, and Eddie might go “wow, that was pretty cool, how do I get me more of that?” And then he does something else and he gets acknowledged. So we can actually, by our words and by our acknowledgement and by taking action – and again it costs very little time and no money to acknowledge those people – and we’ll see tangible results in their productivity, in their attitude, in their overall profitability to the company because we took the time to look at that person as more than employee ID, more than somebody that we’re writing a paycheck to. Peter: So how do you change that thought process? If most of corporate america, and it doesn’t have to be corporate America. It could be almost any business if they had that attitude that they’re there for me to pay them so why should I give them appreciation because it’s their job. How do you change someone’s attitude along those lines? Lisa: I have found, in my audiences, that the companies that desperately need me the most are the ones least likely to hire me. It’s the companies that are already doing things well, that already see the hint or something happened, they know that a change has to be made. They’re the ones that are making the investment. Unfortunately, unless upper management is willing to get that buy-in… and believe me I use a boatload of research, I have so many numbers that I can put dollars on this, like you read on my on my LinkedIn profile. How much money that that eight dollars an hour employee costs. That eight dollar an hour employee can cost you anywhere from $2,000 to more than $16,000 to replace. So if we start looking at the the facts behind it and the money behind it and we see wow, maybe if I start acknowledging Mary and saying thank you and appreciating her for the job she does, maybe it’s not going to cost me $16,000 to replace Mary when she leaves and goes somewhere else down the street. Some people you have to talk to them in terms of numbers. I know a lot of your audience are accountants. It’s all about the numbers, and maybe the people skills aren’t always there because we’re seeing them as numbers. But if we can get beyond that and know that that person is so much more in their ability to contribute to the organization, that’s when the changes start. Peter: So going into an organization, they contacted they because need your help. When you go in, are you doing a series of workshops? What type of process are you put in place for these organizations to change that culture? Lisa: You know, all of the above. Two weeks ago I was at an insurance company and they were bringing in their teams from all over the country. It was their management teams and they were doing a full-day workshop. I was the kickoff speaker. Well they had somebody come in and kind of give a company update and then I had a two-hour session with these managers, and a lot of it is that the company was looking at ways that they can better understand their customers. So getting their managers together to have those conversations. They were looking at transforming the way that they did business because they realize that some of the things that they were doing weren’t working, and I went on Glass Door and I saw some of the things that weren’t working (the website that is kind of like the Yelp of working at companies) and they also wanted to look for ways to delight their customers, and to delight to light their employees. Sometimes it’s giving your managers permission to do these things. To have the conversation so that they can do a better job, but a lot of times I think that that’s really where the program is. When the company is looking at making some changes, when they’re starting to address their their culture, my program is an excellent way to get that kickoff going. Then we continue the conversation and, depending on the clients, sometimes it’s webinar, sometimes a teleseminar, sometimes it’s going in on a regular basis and doing a follow-up program. So it really depends on the client because I really like to personalize my programs to exactly what the client’s looking for. Peter: Okay, I have to go back a little bit because you said something, a website that I have ever heard of. Glassdoor.com? Lisa: Yes, it’s the Yelp of employments. I compare it to Yelp because it’s very rare that people write positive things on Yelp. Lisa: It’s only the people that are really unhappy that go there, and I find the same with glass door. They rate the CEO, they rate the the company itself, and it’s all anonymous. So you know when things are anonymous that people are even more brutally honest than you think that they would be. It’s a good way to get a barometer of how your organization is perceived in the marketplace because, if I go and I check out your company before I come there for an interview and I see that 67 percent of the people are saying “oh this is a horrible place to work, management doesn’t respect us and you know all we are pieces of meat to these are managers here,” I’m not going to go. I’m not gonna waste my time. So even though that’s their experience and mine may be different, that reputation may be keeping employees away from your organization. Peter: Wow. I actually just logged onto it and I think, after this interview, I’m going to snoop around. You’re using it for a lot of different reasons, but you’re also using kind of pre-screen prospects or potential clients on how you would fit within that organization or are they really actually looking for your services or could they just be giving lip service to the employees. I’ve never asked you this question but I have to believe that you’re there not to be the event, you’re there too to be a longer-term goal to help an organization. And if it’s not right, yeah, why do it? Because you’re not gonna have an impact or make a difference in the organization, where your goal is to come in, make a difference, and help the organization understand how to, in this case, retain top talent, and how to retain that steady Eddie person to help the company grow. It’s really a change in attitude and, you know, attitude comes through in reviews. Lisa: Right, and I think that when it comes to the way that I use that, by the time I’m having that conversation, the potential client has already called me and we’ve started the process. In most cases, they’re already looking at doing things different. Glassdoor I use, really, as part of my research process. I’ll go and I’ll read press releases and I go to the website and I just use a lot of different avenues so that I can get a feel for myself, as far as what’s going on in the organization, and a lot of times, if there are problems, I can have a pretty candid conversation with the potential client and say, “Why are you bringing me in? Why now? What’s going on at your organization?” And a lot of times, because they’re focused on it, I had one Fortune 50 company basically say that we put out our annual employee engagement survey, our annual employee survey, and the number one thing that was coming up is that our employees don’t feel appreciated. So it’s just, like I said, I think that by the time it gets to the conversation where a company is calling me and I’m starting that research so I can build that program that’s personalized to what it is that they need, instead of the things that I believe I should tell them. Peter: So this underappreciation, is it just more than a thank you? What else are you hearing and seeing out there from your clients? Why do their people feel like they’re underappreciated? Lisa: I was that I was talking at a Sherman Conference, a society for human resource managers, and I would put out the question of how do you invest in your people? And one woman raised her hand she said well we offer a thousand dollars for each of our employees, every year, to take whatever professional or personal development programs that they want. And there was this collective gasp in the room as people were saying “I can’t afford that. I mean I have 100 employees. I can’t afford a $100,000 dollars to do this,” and as the murmur is going around I asked the woman, “So what percentage of your employees actually take you up on that?” And she said about three to five percent. Lisa: The thing is, though, that the other let’s say 95 percent of the people that don’t take advantage of it, because of the things they have on their plate (the families, all that kind of stuff), whatever decisions they make they still know that their company is investing in them and they can take advantage of it if they want to. So again, there’s a different level of connection, and the three to five percent that are taking advantage of that that opportunity – those are the ones we’re keeping our eye on because that’s where our emerging leaders are coming from. Peter: That’s really cool, and I like the way you use the word investment versus cost because the person in the audience who said we can’t afford that, in her mind, she’s thinking it costs too much. And a mutual friend of ours has made this comment, when you talk about investment, where will it take us? And when we talk about cost we’re just looking at today and it’s not forward-thinking, in a way. “How do we invest in our people?” goes a long way in helping with that retention. Lisa: Absolutely. Like I said, there’s so many opportunities for companies to provide a training and when you look at the opportunity to take an hour off to have a lunch and learn, to bring in subway or something, watch a webinar together, participate in a teleseminar so that your whole team is having the same conversation. Versus sometimes we just send our managers or I’m going to send one manager to training because goodness knows I can’t afford more than one person being off. But you have the synergy of that group of people having the same conversation and being able to brainstorm ideas and and get things done versus one person who goes to training comes back with all these ideas and then the first person says “well that’s stupid, I don’t know how we do that,” and then they give up on it. Lisa: So we just look for ways that we can bring that learning culture into our companies and we can do that, like I said, with technology and everything. Just with us being able to have a conversation on Skype or on Zoom, it feels like we’re sitting in the same room having a conversation together. You can do that. We create these connections and the opportunities for people to learn and grow together. Peter: And it goes to the attitude. It goes to the attitude the organization and it goes to the attitude of the individual, because we can provide this investment to them. However, if they’re in a teleseminar or on a webinar, I want them 100 percent focused on the teleseminar or the webinar. I don’t want the multitasking and I think that’s part of the challenge with technology. I think it looks at that that attitude of that individual as well, and what are you seeing different between the generations? The younger generation wants more of investment into them, they want that learning to be part of their overall career development. Are you seeing any differences between generations, as it relates to this? Is there any rub out there? What do you see? Lisa: Well, definitely with the the youngest of the the generations coming through, the Millennials and beyond, there is that desire to learn, that desire to grow with the organization, and sometimes when boomers or gen-xers look at the track record of the Millennials coming through they don’t take the time because they’re like “well why would I waste my time with that person if they’re only gonna be here for six months or a year?” Well maybe if they had the opportunity to grow, if they saw that you were willing to invest some time in them, then then they would stay longer. Are they gonna stay for 20 years? Probably not. But the thing is, when you look at it, the Boomers had the advantage of the traditionalists kind of putting their arm around them and mentoring them and stuff. The Boomers tried to do that to Gen X. And now we have this group of people that people are not paying attention to because they’re not necessarily seeing the value, the creativity, the desire for growth. All they’re seeing is a bunch of jobs on a resume and they’re discounting this magnificent group of of people that, I believe, by 2020 will make up 75 percent of the workforce. So we have to figure out a way to connect with all of the generations. Peter: Yeah, as we’ve seen this past year, the Millennials outnumber the boomers in the workforce. So boomers, we’re number two. There’s only one way we can be number one: to start killing them off. Peter: And that’s not the right idea, so we’re going to be number two. And also it was about this time last year on CNBC that I saw that Millennials contribute over 2 trillion dollars in consumer spending in the US, and that’s their money not their parents money. Lisa: Yeah, absolutely. I think the other thing that companies are also mistaken is they’re not doing any succession planning for when the Boomers leave. I was doing an HR training program and one of the reasons why there was one woman in the program, and the reason why she was in HR, is because, in one month, her four boomer buddies retired. In one month. And the company had not planned for that. We’re losing a boatload of knowledge, skill, and company history as you’re taking this generation that was the largest generation and is no more, but we are not making the adequate plans to look at who our emerging leaders are and how we can invest in them to, again, help them stay, to help them get the job done, and to not lose so much when that boomer decides it’s time to go. Peter: Yeah, in the accounting profession they’re dealing with that big time, with succession planning, because the Millennials and even the Gen Xers are going “I don’t work like you guys have done. I really don’t want want to do that. There’s gotta be a better way,” and I have shared this story in previous podcast but, in one of my presentations, this one manager came up to him and share the story that he had one of the partners come and give him some work and they said I think we should do it this way, and the manager said well I think I got a better way, and the partner listened to him and he was right. And then he looked at the partner said if this is my firm I’d run it differently, and I said that took some guts. He said yeah, but it but I knew the partner would listen. The partner said what would you do differently? He said you have 10 partners in this firm. You’re killing yourselves. I would move that partnership up to 20 partners, spread out the work and spread out the time so we all have lives that we can lead and that those lives are not always inside of this office. They are looking at things from a different perspective and we need to begin to embrace that different perspective and the creativity that they’re bringing to the table if we want them to take over our businesses or have that succession out there that we can leave them with. Lisa: Right. Oh, absolutely. We’re never going to have work-life balance but we can have work-life integration, and that’s part of the company culture too. People who are working in offices are spending more time with their co-workers than they are with their families, so how do we, again, create the culture where you have that peer to peer recognition? Where you have people who are appreciating each other and it’s not coming across as though you’re just sucking up to the boss. Lisa: That we really genuinely appreciate the efforts that each other are making in the organization and creating that culture where it is fun. Where we are bringing in the family. Where we are bringing in the things that we like. Those connections that, again, are different than they used to be, where you just worked and went home. We don’t have that anymore. We’re connected 24/7 with these smartphones. Peter: I can’t make that up even if I tried. Peter: And I’ve had some conversations, even with some recent partners, who have said we can’t be mean to them anymore. I said well we really should have been mean to them at the beginning. Peter: But that’s part of that old kind of culture that’s out to there that we’ve got to change. Everybody wants to feel appreciated, even if they’ve given their two-week notice, because I’ve always felt that when somebody leaves, that person leaving could be an opportunity down the road. Lisa: Within three weeks that employee left to go down the street to another company. Lisa: When when the joke’s at somebody else’s expense, it’s not funny. Lisa: Not funny at all. It’s something that can potentially hurt somebody… you don’t know how that person is feeling. You don’t know that the deep wound that you can create. I’m sure that that partner, that the guy who was subjected to that rude partner, to this day that still gives him that same knot in his stomach when he thinks about the fact that somebody could talk to him like that. We make a huge difference and those don’t get repaired. Peter: Uh, no. No they don’t. And being a humorous, as I want to consider myself, there are times when humor is appropriate and there’s time when it’s not. And in that guy’s case that you just described, that wasn’t humor. That was a bad joke that, you know, cut deep, and it was like sarcasm to a degree. Lisa: Right, exactly. And like I said, I’m all about humor. I mean I love to laugh and have fun, and I also know that humor at someone else’s expense… a lot of times you don’t know the damage that you can do to a relationship, for the rest of that relationship, because there’s no going back once you say it. Peter: Yeah and I say I think the best humor to do self-deprecating humor because the person that you described, if he had stood up and said wow that reminds me of the letter that I got, it was very similar to that…. it was from my mother! Peter: So you got a laugh to get the self-deprecating humor, but you also appreciate and praise the person for the hard work. Lisa: Absolutely, and that’s what it comes down. It’s just being aware of our language. It’s catching people doing things right, and also you need that buy-in. I know that’s one of the reasons why I really love to work with management teams at management retreats and that type of thing. Because unless the leaders get it and they buy-in, and this is not just another thing we check off. If there’s not that heart level, there is not that sincerity, then employees can see that all day long so why bother. Peter: Right. Be sincere, be consistent, and don’t put a compliance factor around it. Peter: Wow, that’s great advice for everyone in business, whether you’re at the top of the management ladder or even at the bottom of the management ladder, especially when words do matter. We’ve all been hurt by words. Remember that when you’re saying something to another employee or to another manager or whatever. I think just watching our language and being positive in responses goes a long way in overall employment appreciation. Peter: And I’m going to run with this comment for a second because I’ve been hearing this a lot, and I think it goes to to the attitude within the organization. Those who aren’t in a management role are often the first to criticize management’s decision, but not knowing everything that went into that decision. And I don’t know… those who say that my manager’s an idiot, or something like that… well you have to change your attitude. Can you explain to me why he or she’s an idiot? And it basically comes down that the person doesn’t agree with the decisions that are being made, so… then if you can’t make those changes, then you have to change your attitude or you’re in that bottom 20 percent of the employment pool within an organization. Peter: [laughs] Would you like to do a little song for us, please? Lisa: Oh, no no no. Peter: Yeah, and attitude goes a long way and I think it’s Maya Angelou who said “if you want to change something, change it. If you can’t change it, change your attitude.” And I think that we all have a lot of pressures on this, day in and day out, but I think, as you said earlier, we spend a lot of our time within these organizations and I want to be happy inside the organization, so if I’m not feeling happy is it something I’m dealing with personally? If it is, okay, then let’s change the attitude o, as as this one attendee made this comment to me at one of my session, she said “I don’t understand people.” I said well this ought to be good, tell me what you mean, and the example that she gave is that somebody left the organization and they had an opening and normally they would post for this opening. However, they had the ideal person, we will just call her Lisa, to fill that role. So without posting they put Lisa in this role and the whole office went bat crap crazy. And when she called a meeting of everybody to talk to them and she said “You know why Lisa got the job? Because every day she’s walked into this office he has been interviewing a thousand percent better than everybody else here. Every moment that you walk into this organization, don’t think you are not being interviewed because you are and you’ve got all eyes on you so you guys need to do a better job at interviewing every single day, in order to be considered for that next role, which I think goes back to the point of that attitude. Lisa: Right. And that’s why, again, in my research on gratitude things like keeping a gratitude journal, which again is a whole nother conversation for another day, but it’s taking responsibility for yourself to start looking for the good. I have a 30-day gratitude challenge: write down three to five things that you’re grateful for every day for 30 days. I guarantee you things will start to change. What it does is it actually changes your energy, because I believe that we can all change the world one thank you one interaction at a time. One looking for the good, one choosing a positive emotion versus a negative emotion. We all have that choice and we can do that for ourselves. We can also do that for our organization when we don’t think that anybody’s paying attention to us, but it’s still our choice to do the things that we believe will take ourselves and our organizations forward. Peter: Yeah, and we will have a longer conversation as relates to the gratitude journal and along those lines. But I think, before we end this, I think I’d like to take a little shameless plug here and would you tell us what else you do, Lisa? Lisa: Much to his dismay. But now we’re moving to eight meetings a year. September, October, November will still be on sunday so we don’t have to deal with Ohio State football traffic, but the rest of the year (January through May) we will be meeting on Saturdays in Columbus, Ohio. If you’re listening outside of Ohio, or even outside the United States, there is a National Speakers Association in just about every state and every country. You also have a Global Speakers Federation so look into it because it’s a great organization. Peter: Lisa has a ton of energy and and I’ll just tell you that firsthand. I had been a past member of NSA years ago, when I was apprentice, and then I became a member of National and I was kind of deciding would I come back to the local chapter because the leadership has always been good but to me there’s been something missing, and then Lisa jumped into that role and I’ve re-engaged myself back with it within the organization, and I’m so happy that I have. She’s done a great job. She’s got a lot of energy, and I’m thinking about passing a motion at the next board meeting to keep you as president to 2020 or something like that. Lisa: Well that’s not going to happen… but at least I’ll get to be past president, so I have another year and a half on the board and it’s all good, because I love serving. Peter: And next in line is Maureen Zappala, who I’m also interviewing and I believe, if my schedule is correct, she is the one coming right after you. So I know it’s a shameless plug but I tell you what: she does a great job, she’s got a lot of energy, and running your own business as well as being a president of a local chapter of anything requires extensive time management and energy management, and she brings that attitude and passion to every meeting that we have. I just wanted to give her a chance to call that out, and also for me to say, once again, thank her for her time and energy that she’s put into the chapter for the past year and a half, two years, and I look forward to working with her for the main part of the next few years on the board. Lisa: Well thank you thank you. It’s been my pleasure. Peter: And so how can people find you? Lisa: Okay, there’s a couple different ways. I have my website, which is Grategy.com, just like gratitude strategies. At Grategy.com, you can actually sign up for my gratitude thought of the week, which is a short inspirational message that seems to show up exactly when you need it. Lisa: I’ve heard that from a blot of people, so it’s not just me saying it. I can be reached by email: lisa (at) grategy.com. And all of my books, I’ve written eight books, they are all on Amazon. There is another Lisa Ryan, but all of my books, except for From Afraid To Speak To Paid To Speak, are about gratitude. Lisa: So that’s how you’ll tell us apart. Peter: Well, one, thank you very much. I know you’ve provided so many useful tips to this audience to better engage their workforce so they’re not leaving to the competition. They’re staying with the organization. Thank you for your time and, once again, thank you for your service to the National Speakers Association Ohio Chapter. Lisa: They are very welcome. It’s been my pleasure to be here. Peter: I would like to thank Lisa again for taking time out of your schedule to give us ideas on how we can keep our top talent from becoming someone else’s. Lots of great advice that Lisa has given us. In episode 39, I interview Maureen Zappala, who is the Founder and CEO of High-Altitude Strategies. She helps smart people match their confidence to their competence. This is a very interesting interview because Maureen discusses the imposter syndrome. If you don’t know what the impostor syndrome is then get out your encyclopedia britannica and look it up… or just go to Google. Thank you again for listening and remember to show appreciation and gratitude to your top talent so you can keep them on the payroll.